I have just started reading “Kusamakura,” and your comments about it are perceptive and useful. I suppose that Nami is the symbolic centre of the novel, and that she likely stands for whatever might be left of “Old Japan,” her name signifying that nameless quality of “beauty” that one might still find if one looks for it in the right spirit. The reference to Millais that you mention of course conjures up the nostalgia for the Pre-Raphaelite version of the Middle Ages which never quite existed, but which exists as a romanticised construction in the minds of all those who have not seen Monty Python’s “Holy Grail.” Another book I am currently reading is Alex Kerr’s “Lost Japan,” and I’ve already read Alan Booth’s “Looking for the Lost;” I seem to fall for this “lost” theme, and in my 3 years in Japan teaching university (1997-2000) spent quite a lot of time looking for it. 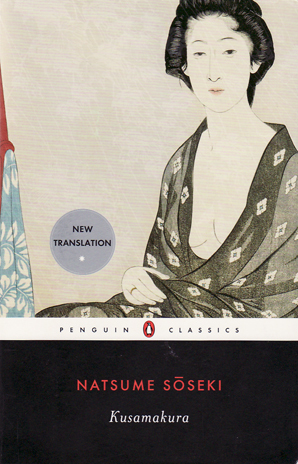 Soseki was lucky– there was more of it around when he wrote this book– but one can still retrace Basho’s steps or find signs directing you to Chomei’s hut (which is not there). In the end, it’s not the physical objects like those which preserve lost Japan, but the atmosphere created by novels like this one, in which the reader can feel it all around, but yet not see it. I have very mixed feelings about Alex Kerr, especially his book Dogs and Demons, which is like Lost Japan except infinitely more vitriolic. On one hand, I can see the physical evidence Kerr describes when ranting about how Japan is mismanaging its cultural and natural heritage, and it does indeed disturb me. On the other hand, I dislike how the conclusion to his argument seems to be something along the lines of “and therefore everything about contemporary Japan is bad.” Studying contemporary Japan and its literature, I wonder how much of Japan is “lost” and how much of it has simply evolved. I also wonder how much Kerr is allowing himself to buy into (and perpetuate) the Japanese nostalgia industry, which has been running strong at least since the early Edo period. In any case, literary nostalgia for a “lost Japan” is a deep and fascinating topic, and it interests me even though I can make almost zero claim to being able to understanding it. I haven’t read Looking for the Lost, but I think I’ll add it to my summer reading list. Thank you!